Chrysler 300C with 10k off | What Car? 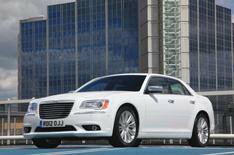 The Chrysler 300C has the largest Target Price discount this month. The big American saloon can now be picked up for £25,995 for the 3.0-litre V6 diesel in Limited trim. That represents a discount of £10,005, nearly 28%, on the list price of £36,000. That's all down to Chrysler offering a manufacturer's bonus to shift its stock. The 300C is a lot of car for the money. Another big car with big savings is the Volvo XC70 2.0 D4 SE S/S. The four-wheel-drive estate car has plenty of room for the family and some will enjoy the raised driving position that it offers. Our Target Price team has found Volvo dealers offering discounts of £6342. That's an increase of 7.2% from last month. So you can now pick up this entry-level XC70 for £26,453. Remember, if your local dealer can't match the Target Price, give our team a call on 0845 123 2620 and they'll put you in touch with a dealer who can.